The Christmas dinner program for Christian refugee children is progressing in both Lebanon and Jordan. I arrived in Lebanon on the 13th of December. 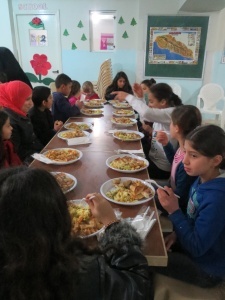 By that time two of the events had already taken place, at which the children had a full Christmas program including a meal, and each child’s family had received a voucher worth $40 at a food market of their choice. 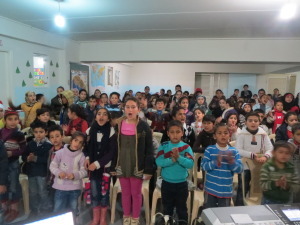 The ministry in charge of the program in Lebanon operated through the churches rather than renting halls. This allowed for far more funds to be used on the program events themselves. The churches participating were excited about the events to be held in their church and volunteers were plentiful. Where the area was large enough there were games to plays. There was also singing of Christmas carols and a puppet show that explained the reason for and the importance of Christmas. Although the program is designed for Christian children, a Muslim family could send a child with the full understanding that the child would be told that Jesus Christ was the Savior of mankind come to save us from our sinful nature. Muslim children did attend some of the events and sang such songs as Silent Night as well as hearing the full story of the birth of Jesus. Each child also received a comic book that told the story of Salvation from the beginning with the taking of the forbidden fruit by Adam and Eve and how that caused all of mankind to be sinful. The cartoon then explained the need for a Savior and described the miracles around the birth of Jesus. Preparing the list of children was very difficult for churches, as many thousands wanted to attend. One Chaldean priest showed me the list of names of two thousand children registered as refugees at his church. Only two hundred could be picked from this list for events there. The task was made easier by limiting the ages from six years to 12 years. We chose six as the bottom as those younger may not be able to fully understand the message or properly eat the portion of meal provided. We stopped at age 12 as it was felt that teenagers could be inattentive at a program designed for younger children to understand. Still there were far more children in that age group at just this one church than places available. Sadly, the lists were further reduced by not allowing any children whose families were on current food programs the churches were able to provide. The names were taken from those refugee families who had registered for the church for help, but were still on waiting lists. The program was non-denominational. Programs were held at Baptist, Chaldean Catholic, and Assyrian Orthodox churches in a wide range of geographic areas. One event was held in Beirut, another in the far north and one of the events I attended was in Zahle which is 53 KM east of Beirut overlooking the Bekaa Valley. 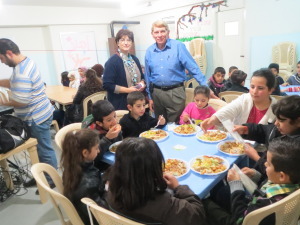 The children, all refugees, were assembled in the basement of the New Vine Baptist Church which operates a small Christian school through seventh grade. The program, with some cost counting, was expanded to 110 children at New Vine. I cannot begin to tell you the joy in my heart to see the children stand and clap and sing about the birth of our Savior in Bethlehem. Alia Abboud of the Lebanese Society for Educational and Social Development and William J. Murray in the midst of the children. Many of the parents of the children attended the second church service in the sanctuary above while the children sang and played. The list was strict, the names were preprinted on each voucher, and a parent could not pick up the voucher unless the child was in attendance. Unlike last year when snow and ice storms interrupted the Christmas meals we had planned, the weather was good and on this particular day perhaps as high as 45 of 50 degrees at times. There were no weather problems this year to keep the children from the Christmas event. In all the program as of December 16th is progressing well and according to schedule. The next refugee children’s Christmas event I plan to attend will be in Jordan on Thursday the 18th. Because of the influx of newly arrived Iraqi refugees after the takeover of Mosul by the Islamic State, all of the children will be recently arrived Iraqi Christians. At a later date an edited video taken at the events will be posted at this site. I wish to thank everyone who helped to make this program possible and my only further request is that you will join me in prayer that next Christmas the program can be greatly expanded. Watch for another report this week! Please join us in helping refugee children celebrate Christmas. Donate today!